Ghanaian Players “Crying” Over Money? Not Really! Hear The Truth! During the wake of Ghana being knocked out of the tournament, lots of posts emerged on various social media platforms claiming that the Ghanaian soccer players were unpatriotic for wanting to get paid. These players have toiled, worked hard and believe it or not, are more dedicated to the team and the country than $100,000 ($3 million total) going to their already deep filled pockets. It is not about the money, but the principle. Let’s dig deep to understand what really happened. Yes, most of these players make more than $100,000 so why the big fuss? Trust or lack of it. The players do not trust the Ghana Football Association. On multiple occasions, the incompetent association has lied to the the players representing the country. The same reason why the FIFA organization is corrupt is the same reason why the GFA is corrupt: Money. There is money in futbol globally and big people are always trying to capitalize through their corrupt means. The GFA is no different from FIFA with regards to corruption, but FIFA is at least a competent organization – this is by no means in support of their corrupt behavior. The 3 million dollars ($100,000 for each player) is money owed and promised to the players as a bonus for qualifying to the World Cup from the GFA. With respect to principles, the players did work hard to qualify for the World Cup and should have had this money before the start of the World Cup competitions, but once again, the GFA tried to pull a fast one, just like they’ve been doing for many years. Most of the players don’t really need the money, but standing on the ground of principles, they were willing to put a stop to the corrupt nature of the GFA. The $100,000 bonus promised to the players is different from the World Cup Prize Money. World Cup prize money — which ranges in Brazil from $8 million for being knocked out in the group stage to $35 million for winning the title — is normally paid after the tournament. 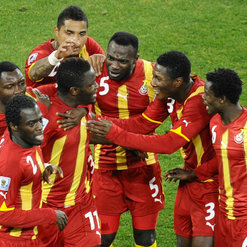 According to ABC News.com “Ghana’s cash-strapped football association has asked for an advance on the $8 million prize money it is guaranteed from the World Cup to pay outstanding debts to players ($3 million they owe the Black Stars). FIFA said Wednesday that Ghana’s request was ‘under evaluation. '” It is not rocket science to understand that the GFA did not want to pay the players the money they have earned but wanted FIFA to pay them money they have not earned. They were trying to borrow $3 million from the already guaranteed $8 million the players were going to earn – this is certainly not fair and definitely cutting into the shares of players. The players were upset because they have already experienced this in a different fashion before (4 and 8 years ago) and were not willing to go through it again. They were willing to put a stop to this cycle once and for all. The players were not being greedy but were not going to be duped again. They were ready to put up a fight against the corrupt nature of the Ghana Football Association. They have worked hard, earned their spot at the World Cup and deserve the bonus they were promised. They are professional athletes and not charity athletes. To them, this is a career and their wages should not be toyed with. Unfortunately for Ghanaian supporters World Wide, this incident placed Ghana on the map in a very negative light and caused some disagreements at the Black Stars camp in Brazil. Sulley Muntari who is a very vocal leader lost his cool and overreacted and this led to his suspension. Kevin Prince Boateng on the other hand was simply not getting along with the coach and was also suspended – all of this destroyed the morale of the Ghanaian Black Stars who for the past week and a half, have been playing great futbol at the World Cup, but against Portugal, they looked drained, tired and could not concentrate. It’s no surprise that both goals from Portugal came directly from errors by the Ghanaians. They simply could not focus. This is what happens when you have an incompetent association full of corrupt officials who constantly interfere with the work of young professionals. Say what you want about Akwasi Appiah (The Ghanaian Coach) and his tactics, but in my humble opinion, he is a competent coach who was sabotaged by an extremely greedy and corrupt association in the name of the Ghana National Football Association. They created an environment where the players were not able to focus which led to their failure. The environment was simply not conducive for success. Your environment is critical to your success just as your will and drive is. In case you did not know, no African team has won the World Cup – yet alone make it to the semi finals. Do not be surprised, because if you can’t manage your affairs in life, you will simply not win in life. Our leaders are too incompetent to manage effectively or successfully. Let’s not put the blame on the players. They fought a good fight. They gave their all, but they needed major help from our leaders. Even though I am based here in the United States, I will forever be a proud Ghanaian and will forever support my team, but there has to be some major changes concerning leadership. Africa can do better, but we the people have to stand up, step up and speak against the injustice of our leaders or else the cycle of failure due to poor management will never end.